We have hip and groin exercises for rehabilitation of specific injuries including groin strain. Early, mid, and late stage exercises, although this is only a guide and we recommend seeking professional advice. These exercises are often done as soon as possible after injury if the pain will allow. The aim is to restore range of motion without putting any damaged tissues under stress. The exact exercises and how quickly you progress through will depend on the type and severity of an injury. Active mobility exercises where the athlete physically attempts to move the joint through a range of motion are often the first step. Isometric groin contraction exercises involve a contraction of the inner thigh muscles, without movement of the hip joint. They are a great way of starting to load the groin muscles in the early stages of rehabilitation. 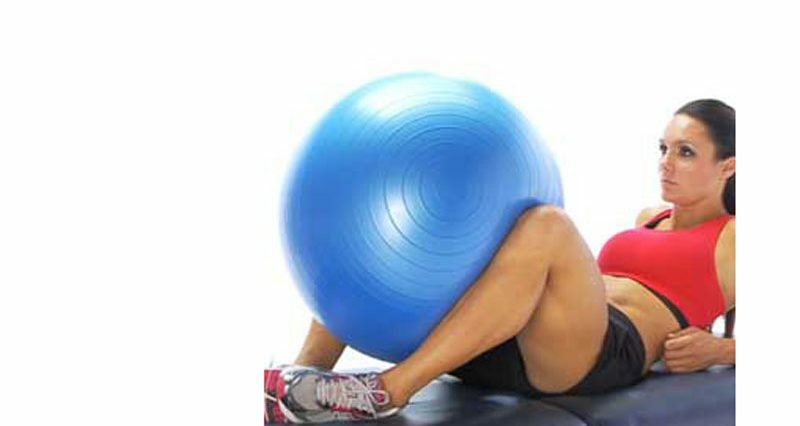 The athlete lies on their back with a ball (either a small football, medicine ball or swiss ball) between their knees. They squeeze the thighs into the ball, holding the contraction for a few seconds before resting and repeating. This exercise can be performed with the feet flat on the floor or with the feet raised and knees at 90 degrees. Isometric exercises are muscle contractions without movement (static contractions). Isometric hip abduction means contracting the muscles which move the thigh outwards. The athlete sits in a chair with the knees bent and feet flat on the floor. The hands are placed on either side of the outer knees, as shown. The athlete then uses their hands to resist as they try to push the knees (thighs) outwards. The contraction is held for 5 to 10 seconds before they relax and then repeat the exercise. Isometric exercises involve muscle contractions with no movement of the body part (static contractions). A hip extension can be performed as shown here to work the buttocks! To begin to work the buttock and hamstring muscles, the athlete lies on their back. They push the leg down against the surface (floor or table). Ensure that the buttock muscles are contracted throughout. Static contractions are muscle contractions with no movement of the limb. In this case, the hip flexor muscles are contracted against resistance. To begin to work the hip flexors at the front of the hip, the athlete is seated as shown. They use one hand on the lower thigh to provide resistance, as they attempt to lift the leg up. Avoid using the foot to push off. Hold for 5 or 6 seconds and gradually release. Repeat 10 times. The straight leg raise (SLR) exercise is a common exercise which is used in the early to mid stages of rehabilitation for a knee, hip and thigh injuries. It works the hip flexor muscles. The starting point is lying on the back with both legs out straight. One leg is then lifted a few inches off the couch/floor, keeping the knee straight. The position may be held for 2-5 seconds before the leg is lowered slowly back to the floor. The hip extension in prone exercise may also be known as a reverse straight leg raise. It is a good starting point for strengthening the glute and hamstring muscles. To strengthen the hamstrings and buttock muscles the athlete lies on their front and raises the thigh upwards off the couch. Keep the knee straight throughout. Slowly lower the leg back down and then repeat. Ensure that the buttock muscles are contracted to initiate movement. Hip extension exercises such as this work the glute muscles (buttocks) and the hamstrings at the back of the thigh. This is an early stage exercise as no weight is added, only gravity is used as resistance. In an all fours position, the athlete raises one leg behind them, keeping the knee bent and moving the sole of the foot towards the ceiling. Once at the top of the movement, they may hold the position briefly before returning slowly to the starting position. Hip adduction exercises involve moving the thigh inwards across the line of the body. Laying on the side of the leg to be worked means gravity can be used to increase resistance. Ankle weights can also be added. To strengthen the groin muscles the athlete lies on their side with the leg to be worked on the bottom. The top leg is bent out of the way as shown. The athlete lifts the bottom leg as high as is comfortable, keeping the knee straight. The side-lying clam exercise strengthens the hip abductors such as gluteus medius. It is commonly used in rehabilitation of lower back pain and hip injuries. Lie on your side. Rest your head on your arm or hand as shown. Bend hips to approximately 45 degrees and bend your knees at 90 degrees. Make sure one hip is lying above the other. You should now be well aligned- your feet should be in line with your back. Float the upper leg upwards while keeping your feet in contact with one another. Inhale and as you the leg down to the starting position. Repeat 5- 10 times each leg. During the mid-stage exercises progress to gentle strengthening, gradually increasing the load on the joint and through the recovering tissues. Balance and proprioception training usually begins. Hip adduction is the movement of bringing the leg across the body. This is used in kicking. A resistance band can be used as shown. Stand with the band around one ankle and attached to a fixed point in front. Use something to hold onto if you need to. Keeping the leg straight extend the hip as far as comfortable and return to the start position. Keep the hips square on facing forwards and perform the exercise in a slow and controlled manner. You should feel it working the buttock muscles. Eccentric exercises focus on strengthening the muscle whilst it lengthens (rather than shortens). This happens to control a movement. So, in this case, a therapist applies a force and the patient slows it down. The athlete is positioned on their back and the therapist at their foot end. The therapist forcefully moves the leg out to the side and the patient controls and slows down the movement. Hip adduction is the movement of bringing the leg across the body. This is used in kicking. The piriformis muscle is a small muscle found deep in the buttocks. It can be troublesome, especially in runners and can result in nerve compression and sciatica symptoms. To strengthen the hip abductors on the outside of the joint, the athlete starts with a resistance band anchored to a doorway or chair leg and wrapped around the ankle. The leg is taken out to the side as far as possible, before slowly returning to the starting position. Hip flexion is the movement of bringing the thigh forwards. Performing this exercise with the knee bent reduces the input from the quads and uses mainly the Iliopsoas muscle. The patient lies on their back with the band wrapped around the thigh and ankle as shown. They then pull the knee up towards the body, keeping it slightly bent at all times. Slowly return to the start position and repeat. The bridge exercise is a great one for strengthening the bum muscles and the hamstrings. It can be used in rehabilitation and also for toning purposes. The athlete starts lying on their back with the knees bent and feet flat on the floor. They tend to raise the buttocks and lower back up off the floor as high as possible. Ensure to really squeeze the glute muscles. This position can be held for as long as required. Slowly return to the start position and repeat. The hip raise exercise (sometimes called hip drop or hip hitch) is a great one for runners suffering from hip or knee pain. It strengthens the muscles responsible for the level of the hips when standing on one leg. The starting point for this exercise is sideways on a step with one leg unsupported. The unsupported leg is lowered towards the ground from the hip. The knees of both legs stay straight throughout. Drop the foot as low as possible before reversing the movement to list the hip as high as possible. This works the muscles around the hip on the standing leg. This lateral rotation (external rotation) exercise works the muscles in the bum, called the glutes. It is helpful for people whose knees rotate inwards when running! To work the hip rotators in the buttock, the athlete lies on their front with the band wrapped around the ankle as shown and the knee bent. The hip is rotated outwards so that the involved ankle moves across the other leg. The medial rotators (sometimes called internal rotators) are muscles around the hip which turn the thigh inwards. They can be worked using a resistance band, as shown here. To work the hip rotators, the athlete lies on their front, with the band wrapped around the ankle as shown and the knee bent. The hip is rotated so that the ankle moves away from the band’s attachment point. These exercises are more functional and sport specific. The aim is to restore full strength and mobility to the joint and return the athlete to full training and competition. The alternate leg hip extension exercise is similar to a bridge but a little harder as it alternates weight between single legs. The weight is rested between the forearms and heels as shown. The weight is then transferred from one leg to the other as the alternating leg is raised just off the floor. Try to keep the pelvis as still as possible throughout. The figure 4 lift exercise works the external hip rotators (sometimes also called lateral hip rotators) which are found in the buttocks. To strengthen the hip rotators, the athlete lies on their front with the leg to be stretched bent and the ankle under the other thigh. The athlete then lifts the bent knee as high as possible. It is then slowly lowered back to the floor/couch, before repeating the exercise. Good mornings are a well-known exercise to strengthen the hip extensor muscles. Be careful with this one if you have a history of any back pain. The starting position is a shoulder-width stance, with the bar over the shoulders as shown. From here, the athlete bends forwards from the hips, keeping the lower back straight. Once parallel to the floor, the movement is reversed to stand upright again. Walking hip abduction is an exercise which uses a resistance band to strengthen the glute muscles and prevent the knees falling in when running and squatting etc. To work on the hip stabiliser muscles, a small resistance band is wrapped around both ankles. The athlete then moves one leg out to the side, whilst maintaining balance and stability as weight is transferred. This is repeated, walking to both sides as shown. Performing a squat in a wide leg position works the adductor muscles (groin) more than a conventional squat. The starting position for a wide leg squat is with the feet more than shoulder width apart and the toes pointing outwards. From here the athlete bends both knees, keeping back straight. Ideally, the knee should reach a right angle (90 degrees), but if not this is something you can work on. Don’t go past a right angle. Make sure the knees do not more in front of the toes, keep your weight over the midfoot and heel.